You will, no doubt, notice differences in Godey’s Ladies magazines and what was everyday clothing in our geographic area. The individual adjusts and adapts the fashion trends of the time to fit their own individual personality and taste, as well as their economic condition and available resources. After all, if one can only afford a dress or two each year, they are more likely to be rather conservative and plain. Often the women would add to or take away from their simple gowns and day dresses. 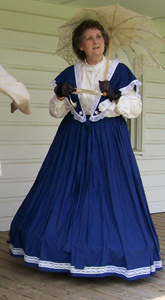 Have you begun to prepare your period clothing for 2010 Historical Evening? 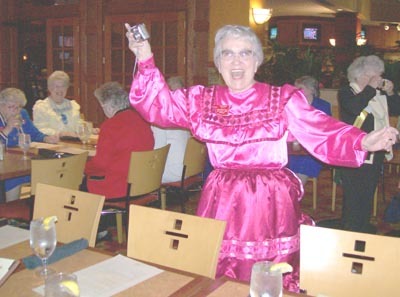 A solution to “dressing with southern spirit” is to watch the resale or “second hand” shops. Buying wardrobe items have several benefits, besides being able to find a great buy on a hard to find design for you. They include charity and veteran support if buying from somewhere like Goodwill, Salvation Army, or DAV (Disabled American Veterans). Being green is something in vogue, but when buying clothing that has already had a life, you are doing primary recycling – reusing something that doesn’t take extra resources to prepare for reuse. Finally, resale shops are not limited in trends, fabrics, designers, or sizes. They pull from all walks of life, all sizes of people with different tastes, as well as many design periods. While buying 100 year old clothes are not an option, 50 year old clothing pieces have been spotted at several charitable resale outlets. Item to look for include shirts and skirts that can “pass”, gloves, collars, “granny boots” and slippers, aprons, capes, linen and lace to use for fichus, hoops and petticoats, even curtains and sheets that can be used as yardage for custom made creations – the list goes on and on!